Shigatse (གཞིས་ཀ་རྩེ) is the second largest city in Tibet . 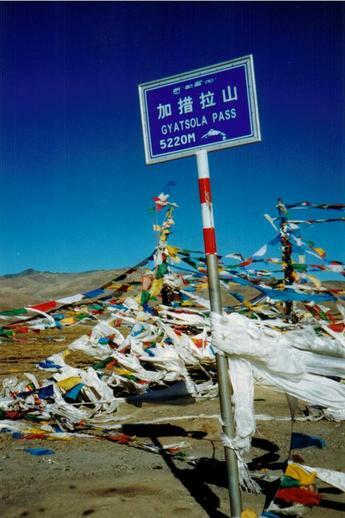 It is located 265kms / 166 miles southwest of the capital city of Lhasa in the traditional Tibetan province of Tsang. It has a population of around 100,000. Shigatse is the name of a city, county and prefecture. Shigatse prefecture has 18 counties and borders Nepal on the south. Mt. Everest, the highest mountain on earth, is found in Shigatse prefecture. 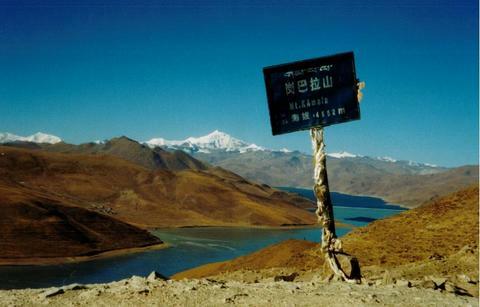 Shigatse sits at 3900m / 12,795 feet. Shigatse, like many regions of Tibet, has under went major modernization over the past few decades. 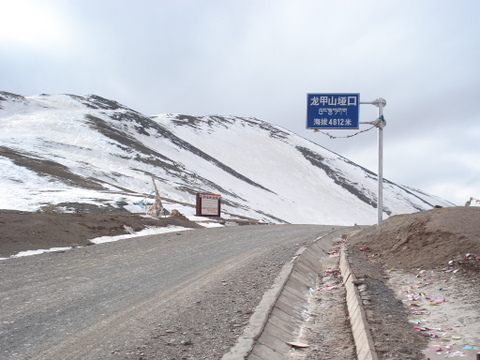 Though the train line in Tibet does not extend to Shigatse currently, it will in the future. The Chinese government has plans to extend the Tibetan Plateau railway to Shigatse within the next few years. 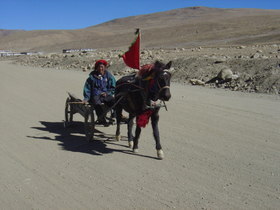 The only way to reach Shigatse is by road. 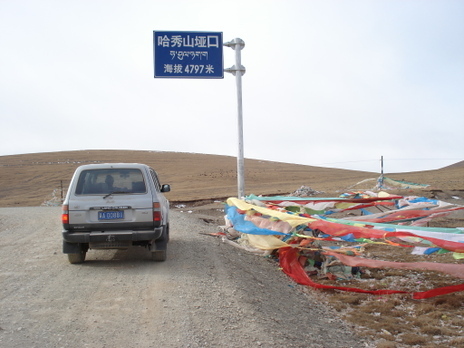 In 2004 it took nearly 8 hours to drive from Lhasa to Shigatse. Now it can be done in about 5 1/2 hours (there are speed restrictions along this route). The road between the two main cities in Tibet is one of the best in the country. The main attraction in Shigatse is Tashilhunpo Monastery. This is one of the most important Gelug sect monasteries in Tibet and is home of the Panchen Rinpoche (Lama). 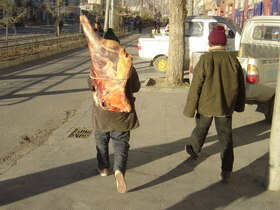 Even though there is really only one attraction to see in Shigatse, it is worth going to. The kora (circular path) around the monastery is great to take and offers some excellent views of the city. There are a lot of hiking options in the mountains surrounding Shigatse. There are several good hotels to stay at in Shigatse and plenty of decent restaurants to choose from. 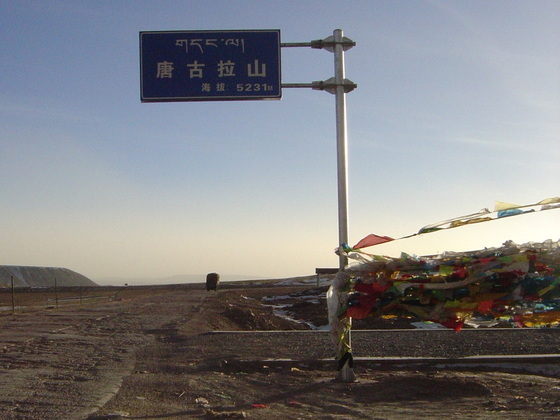 Because of the strict travel rules within the Tibet Autonomous Prefecture (TAR), the only way to legally go to Shigatse is through a travel agency. Traveling by public bus from Lhasa to Shigatse is not allowed for foreigners, though some people are able to purchase tickets illegally (this has not been possible since March '08). Shigatse is a city full of history and culture. Most people who go to Shigatse only stay for a day or two as part of a week long trip to Mt. Everest and the Nepal border. If you like hiking, there is enough to keep you busy for several days, otherwise two full days is enough to see everything. Getting to the summit of Mt. Everest was the goal of many mountain climbers during the first half of the 20th century. Many died in their attempt to climb the highest mountain in the world. Everest, known as Chomolangma (or Qomolangma) in Tibetan, was first scaled by the team of Tenzing Norgay and Edmund Hillary on May 29, 1953. Since then, the mountain has been summited nearly 4000 times. The top of Everest sits at 8848m / 29,028 feet. The base camp of Everest on the Tibet side sits at 5200m / 17,060 feet. 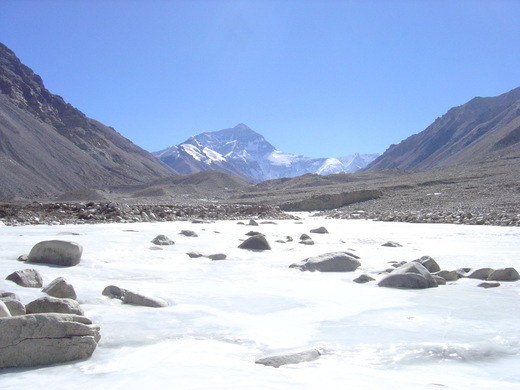 The picture above is taken from Rongbuk monastery at 5000m. I have been fortunate enough to go to Base Camp many times over the past few years. While the coldest time of year to go to Everest is the winter, it also is the best time to get clear pictures. I have been at Base Camp in the winter when it has been -25C (-40C with wind chill) and I have been there when it has been -5C. If the sun is shining, it will probably feel much warmer than what it actually is. The sun at 5200m is quite intense. Sunburns can happen very quickly if you aren't prepared. Most people who travel to Everest take 5 to 7 days to make the journey from Lhasa to Everest and back. The most popular stops along the way are at Yamdrok Lake, Gyantse, Shigatse and Sakya Monastery before arriving at Base Camp. This is one of the most popular routes that travelers take in Tibet. While this route is on the well worn tourist path, it is a great one to take. The views of the Himalaya are stunning. There is no public transportation going to Mt. Everest. All travel to the area must be arranged through a travel agency. During the high season, the furthest you can go to base camp is to the "tent city", which is 3kms before base camp. From "tent city" you need to take a bus the remaining distance. The bus costs Y25 per person for the round trip ride. Another option is to hike the remaining distance. During the low season, the bus stops running so your vehicle can drive all the way to base camp. What is there to say about the Himalaya's? They are amazing. Stunning. Breath taking. No one who sees them is dissappointed. With Mt. Everest topping out at 8848m, it is the highest peak in the Himalaya's and in the world. 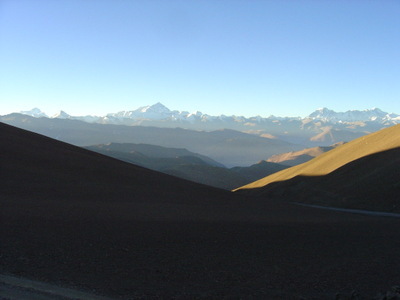 From the Pang La mountain pass (above) on the Tibet side of the Himalaya, you can see not only Everest, but Lhotse (8516m /27,940 feet), Makalu (8463m / 27,766 feet) and Cho Oyu (8201m / 26,906 feet). On a clear day, there are few places on earth more beautiful. The best time to see the Himalaya's are in the winter. The winter months usually have a lot of sunny days. Summer is also a good time to go, though the weather is not as clear and sunny as in the winter. Winter is also a good time to go because there are less tourists at places like base camp and Tingri which have good views of the mountains. The Himalaya's are a dream destination for many people. If you are a solo traveler or are looking for people in Lhasa to help share the costs of a trip to see the Himalaya's, it would be best to check all the reader boards at the popular guesthouses and hotels to find others to go with you. If you are traveling with a group of 3 or more, we can arrange train travel from Xining to Lhasa and then arrange a trip to the Himalaya's. A typical journey from Lhasa to Everest Base Camp going through places like Yamdrok Lake, Gyantse, Shigatse and Sakya Monastery takes about 7 days. For more information on the Himalaya Mountains, please send an email to thelandofsnows@gmail.com. Tashilhunpo monastery, located in Shigatse, is another of the six great Gelukpa monasteries of Tibet. This monastery was founded in 1447 by Gyalwa Gendun Drup who was the nephew and a disciple of Tsongkhapa. Gyalwa Gendun Drup went on to become the first Dalai Lama. Later, the fourth Panchen Lama Lobsang Chokyi Gyaltsen, added major additions to the monastery. Tashilhunpo Monastery is famous throughout Tibet for being the home of the Panchen Lama. The Panchen Lama is the second highest ranking lama in Tibet after the Dalai Lama. The Panchen Lama is said to be the incarnation of Amitabha Buddha. Since the fifth Dalai Lama, Ngawang Lobsang, the person occupying the seat of Dalai Lama has been involved in the final selection process of the new Panchen Lama. In turn, the person occupying the seat of Panchen Lama has been involved in the selection process of the new Dalai Lama. The most famous Panchen Lama was the tenth, Chokyi Gyaltsen. The tenth Panchen Lama was born in 1938 in a small village in northeast Amdo province, Tibet (modern day Qinghai). He was officially recognized as the tenth Panchen Lama in June 1949. In 1968 he was sent to prison for criticizing the conditions of Tibet and in particular the conditions of the Tibetans of his home province of Amdo. In 1977 he was released from prison, but remained under house arrest in Beijing until 1982. After being released he was considered to be politically rehabilitated. He was soon given the office of Vice Chairman of the National People's Congress. Even though he was given this position, he continued to speak out and represent the Tibetan people. He died under mysterious circumstances in January 1989 shortly after arriving again in Shigatse. Tashilhunpo is located in Shigatse, 265km / 166 miles west of the Tibetan capital of Lhasa. Shigatse is the second largest city in Tibet and is located on the Friendship Highway...a highway connecting Lhasa with Kathmandu, Nepal. In the 1950's Tashilhunpo had a monk population of around 4000. Today it is a fraction of that. 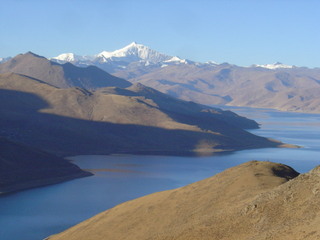 Tashilhunpo was closed during the Cutural Revolution, but was hardly damaged compared to most monasteries across Tibet. It was reopened in the early 1980's and has since become a major tourist attraction among foreign and Chinese tourists. Ganden monastery is another of the six great Gelukpa sect monasteries in Tibet. 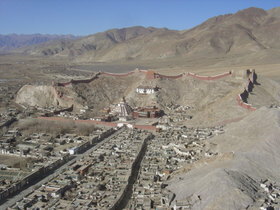 Ganden is located 47km / 29 miles east of the Tibetan capital city of Lhasa. Ganden was founded by Tsongkhapa, who was the Tibetan buddhism reformer who started the Gelukpa sect. Tsongkhapa had his disciples build the monastery and it was finished in 1409. Ganden was the first of many Gelukpa monasteries to be built in Tibet. Tsongkhapa spent most of his last years at the monastery. He died at Ganden in 1419 and his remains are still kept there today. Contrary to popular belief, the Dalai Lama is not the head of the Gelukpa sect. The abbot (commonly called a "tripa" which means throne holder in Tibetan) of Ganden monastery has always been the leader of the sect. The tripa is not a reincarnation like the Dalai Lama. Instead he is appointed. Each tripa of Ganden monastery serves a 7 year term. The Ganden Tripa traditionally has been one of the highest political and religious leaders in Tibet. The current Ganden Tripa is Khensur Lungri Namgyel who was born in Kham (east Tibet) in 1927. He is the 101st Ganden Tripa. Before 1950, Ganden had around 5000 monks. Today it has around 500 monks. During the Cultural Revolution the monastery was completely destroyed. It was rebuilt in the early 1980's. Ganden is well known for its kora. The kora (pilgrim trail around the monastery) gives you an awesome view of the Lhasa river valley from 4500m / 14,760 feet. During Tibetan New Year, thousands of pilgrims from across Tibet go to Ganden to walk the kora. Getting to Ganden is easy. Buses leave from in front of the Barkhor in Lhasa every morning from 6:30am to 7:30am. A roundtrip ticket costs Y20 ($2.50USD). The trip takes about 70 minutes. The entrance ticket for the monastery costs Y45 ($5.75). Buses return to Lhasa at around 1pm. The kora around the monastery takes about an hour. Mt. Everest, known as Chomolangma in Tibetan, is the highest mountain on earth at 8848m (29,023ft). Everest has base camps on both the Tibet and Nepal sides. 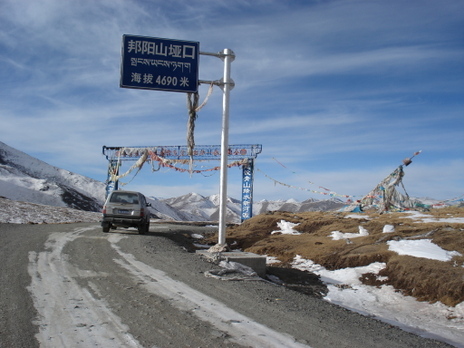 The Tibet side base camp sits at 5200m (17,058ft). During the winter months, the views of Everest and the Himalaya are at their best as the skies are usually bright and clear. 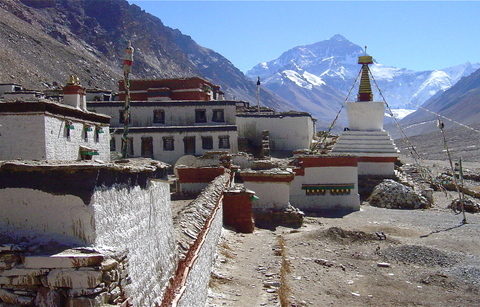 Rongbhu Monastery (pictured above) is the highest monastery in the world at 5000m. Everest base camp sits 8km to the south and dominates the background of Rongbhu. Getting to Everest is easy from Lhasa. There are numerous travel agencies in Lhasa that can arrange a 5 to 8 day trip to Everest. If you are traveling with a group of friends it is possible to take a 7 day trip to Everest and back to Lhasa for as little as $120 per person. Most of the way to Everest is along the Friendship Highway...a highway that connects Lhasa with Kathmandu, Nepal. About 240km (150 miles) before the Nepal border you turn off the Friendship Highway and head south to base camp. The turnoff to Everest is 6km past the small town of Shegar. Many people going to Everest straight from Lhasa choose to stay the night here and then head up to the mountain first thing the next morning. From the turnoff, it is 99km to base camp. On the way to base camp you cross over Pang La, a mountain pass sitting at 5120m (16,795ft). From Pang La (pictured below) you get an amazing view of the Himalaya. There are 14 mountains in the world above 8000m (26,242ft) and you can see 4 of them from this pass (Everest, Makalu, Lhotse and Cho Oyu). Coming down from Pang La you reach the small village of Tashi Dzom. There is a small guesthouse there that we have stayed at a few times called the Chomolangma Benpa Guesthouse. 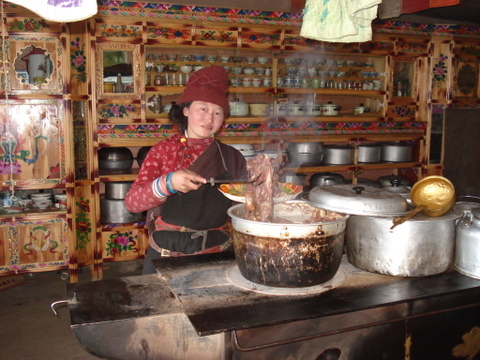 It is a comfortable guesthouse run by a friendly Tibetan family, but can be very cold in the winter. At Everest Base Camp, there is a small hill that is covered in prayer flags. 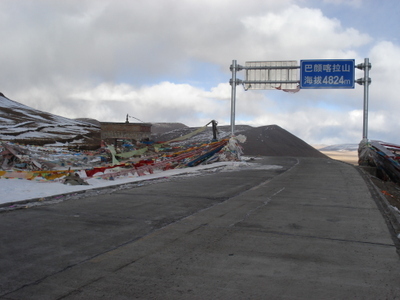 On top of the hill there is a sign that says you are at Chomolangma Base Camp at an elevation of 5200m. There are plenty of places to do some hiking, but you will need additional permits to go to any of the advanced camps. Hiking at 5200m (17,058ft) takes a lot out of you so only those who are fully acclimatized and used to high altitude hiking should attempt to go any higher.There is a memorial area at base camp for those who have died trying to climb it. Most of the memorials are small piles of rocks with a small headstone with the persons name written on it. Many of the memorials are adorned with Tibetan prayer flags. If you are interested in going to Mt. Everest, please send an email to thelandofsnows@gmail.com.